Mad Men Carousel is an episode-by-episode guide to all seven seasons of AMC's Mad Men. 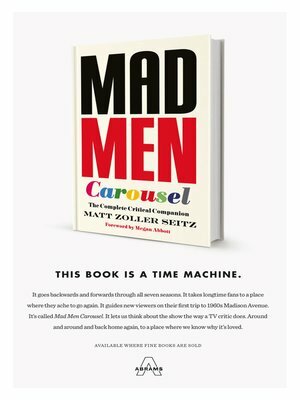 This book collects TV and movie critic Matt Zoller Seitz's celebrated Mad Men recaps—as featured on New York magazine's Vulture blog—for the first time, including never-before-published essays on the show's first three seasons. Seitz's writing digs deep into the show's themes, performances, and filmmaking, examining complex and sometimes confounding aspects of the series. The complete series—all seven seasons and ninety-two episodes—is covered. Each episode review also includes brief explanations of locations, events, consumer products, and scientific advancements that are important to the characters, such as P.J. Clarke's restaurant and the old Penn Station; the inventions of the birth control pill, the Xerox machine, and the Apollo Lunar Module; the release of the Beatles' Revolver and the Beach Boys' Pet Sounds; and all the wars, protests, assassinations, and murders that cast a bloody pall over a chaotic decade. Mad Men Carousel is named after an iconic moment from the show's first-season finale, "The Wheel," wherein Don delivers an unforgettable pitch for a new slide projector that's centered on the idea of nostalgia: "the pain from an old wound." This book will soothe the most ardent Mad Men fan's nostalgia for the show. New viewers, who will want to binge-watch their way through one of the most popular TV shows in recent memory, will discover a spoiler-friendly companion to one of the most multilayered and mercurial TV shows of all time.